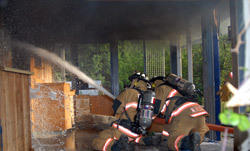 The Primary mission of the Pigeon Forge Fire Department Training Division is to provide on-going training, education and certification to fire service personnel necessary to insure a competent, efficient and effective emergency response organization. It is the further mission of this division to provide the necessary research, evaluation and recommendations for new products and procedures necessary to maintain a state-of-the-art emergency response organization. Is responsive to our community’s needs and concerns. Is a model of excellence in providing emergency services to the community. Is dedicated to continuous improvement in the services we provide. Fosters an environment of trust and involvement of our members and the community.